Not everyone gets their name called during the NFL’s annual three-day draft festivity. In fact in 2012 only 253 young men had their name called and their little video profile shown on NFL Network or ESPN. For the rest of the guys who left blood, sweat and maybe even a few tears on the field of play during their college careers the hope remains that a call will come soon after the draft has moved away from Radio City Music Hall. 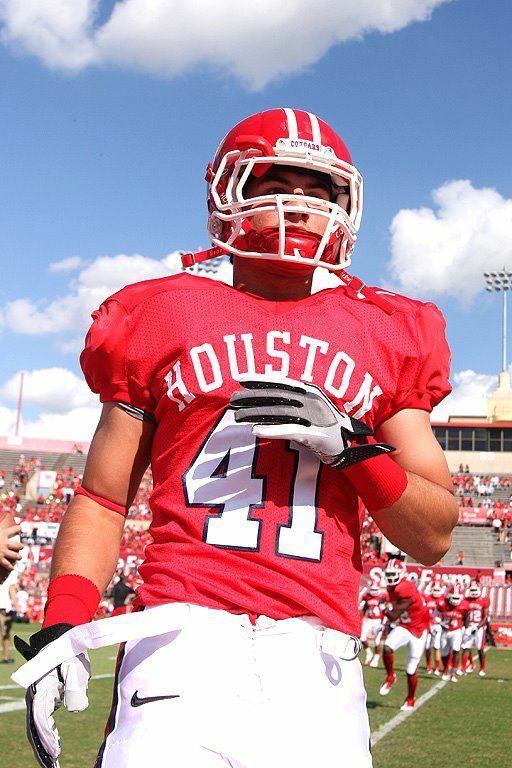 One such man who indeed had to wait until after the 2012 Draft before he got a call from an NFL team was former University of Houston free safety Nick Saenz. The Buffalo Bills signed him on 14 May when they broke the news on their website. 6 ft 1 190 pounds Saenz played four years in Houston, serving in 52 games, recording 240 total tackles, forced three fumbles, snagged three interceptions, and even recorded a safety in 2009. 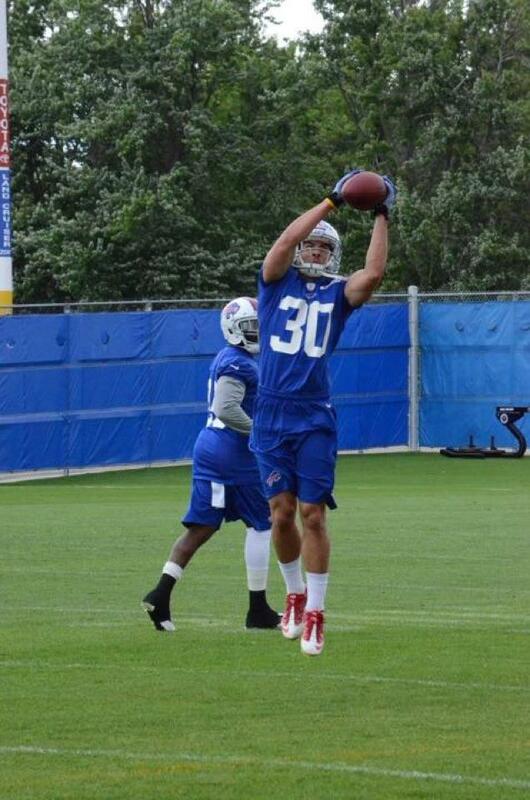 NFL FAN IN ENGLAND’s Lawrence Vos talked to Nick in June 2012 about his experience post-draft, his love of pink lemonade, and his absolute pleasure of putting on an NFL uniform, in this instance a Buffalo Bills one, for the first time. LV: You were picked up by the Buffalo Bills as an undrafted free agent. How did this happen and what were you doing when you got the call? Also what did you do immediately after finishing the phone call? NS: I was at my bay house relaxing.. As soon as I heard the news I called my parents to tell them the news. 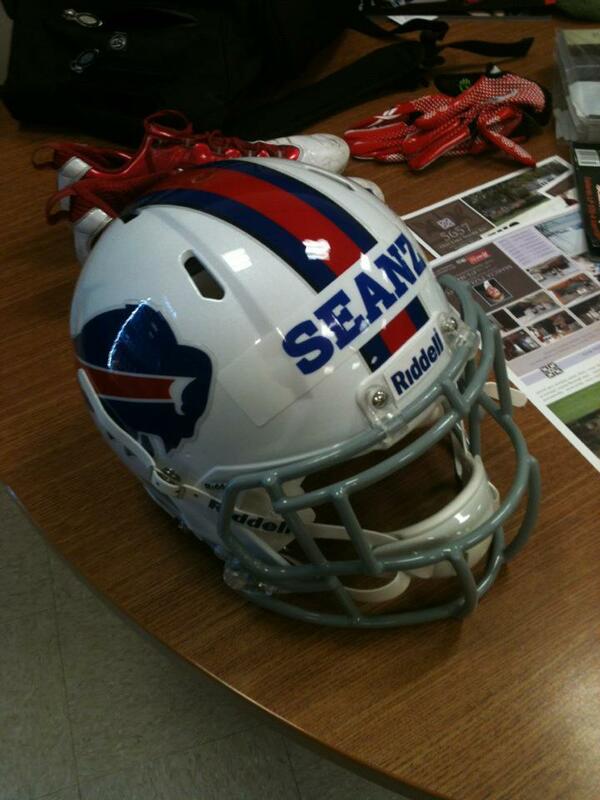 LV: You will be in camp with a former #1 overall NFL pick Mario Williams, and a true up and coming defense. What are you looking forward to the most working with such a rising set of defenders? NS: I’m just looking forward to learning as much as I can from the great players. LV: You also get to learn from Pro Bowl safety Jarius Byrd. What do you hope to learn from Jarius and the other veteran defensive backs? NS: To just soak in all the information that I can from a safety like Jairus. LV: You are known for your speed and for laying the wood. Is that your biggest asset or do you have other football skills that best describe what you will bring to the NFL? NS: I consider my self a smart safety and try to put myself in the best position possible. LV: Now that you are going to be around NFL players in camp what is the plan going in? NS: To become a buffalo bill and anything I can do to make that happen I’m willing to do. LV: You must have been upset not to have heard your name called in the draft. Did you get calls from NFL teams during the draft saying that they were interested? If yes who were they, when were they ringing you and what were they promising? NS: I had talked to Arizona and them only before Buffalo. LV: Where were you and who were you with when you were watching the draft? Or were you away from a tv or the internet doing something else with someone else? NS: At my mom’s house with family. LV: What did your family and friends say to you after the final pick was made and you were not one of those selected in the draft? NS: they didn’t say much but everything will work out. LV: What role do you think your are best suited for in the NFL and why? NS: I will be whatever role the Buffalo Bills want me to be. LV: How regularly do you Tweet and who do you get the most pleasure following? Also what are some of the strangest things you have been asked via Twitter? NS: I don’t have a twitter. LV: How did you get from pee-wee football to the NFL? Was it always the plan or did you surprise yourself? NS: Professional football was always a dream of mine but it took a lot of dedicated time and effort to get here. LV: What is your earliest football memory? Describe where you were and what you were doing? NS: I can remember all my pee-wee days at the dads club with all my buddies. Those memories are still very vivid. LV: You were born raised and played all levels of football in Houston, Texas. Was your experience of high school football one that was similar to the experiences of those high school football players in the television series Friday Night Lights with rally girls, special privileges and god like status (I have watched almost every episode here in England)? Also what is one of your favourite college anecdotes? NS: Pearland is known for football but still didn’t get the privileges shown on the show. There were a few though lol. LV: What are some of the most valuable lessons you learnt from your Coaches – which coaches and what were the best lessons learnt? NS: I have been blessed with great coaches from pee wee to highschool to college and now the NFL. Can’t pick any individual coach cause they have taught me so much. LV: Who are some of your team-mates that you graduated with that you think should also be given a shot in the NFL and why? NS: I think Brian Thomas offensive linemen for Texas Tech( transfer from Texas A&M). Really athletic for his size. LV: What does Nick Saenz do to relax? Favourite tv shows? Favourite food and drink? NS: I love to just sit around and watch Netflix. I like watching that 70’s show. My favorite food is probably Mexican food with a pink lemonade. LV: Did you grow up a Cowboys fan or did you follow a different NFL team and which college team dis you dream of playing for as a child? NS: I grew up a packer fan, my mom’s side of the family is all from Wisconsin so they are huge fans. But I believe they have switched to buffalo fan. And I never cared who I played for I’m just grateful that buffalo gave me this opportunity. LV: Which NFL defensive backs did you admire growing up and which NFL defensive backs do you admire at the moment? 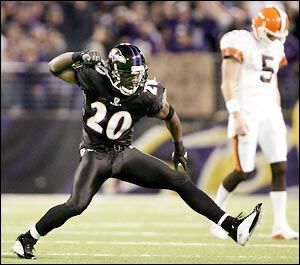 NS: I grew up really watching Ed Reed (Baltimore Ravens) and still admire his play. LV: Here in England we have had NFL teams play a regular season NFL game for the past five years, and we have the Patriots playing the Rams here in England in October. What do you think about NFL teams playing in England and what do you think about one day there being an NFL franchise based in London? NS: I think that’s pretty neat how they get to play in another country. I don’t know how that would work with a NFL team in London. A lot of traveling and then it wouldn’t be the NFL. LV: What is your typical training routine and what do you find the hardest part and the easiest part? Also have you had any injuries or are you injury free? NS: Honestly I like the practicing/ playing part instead of the film/ meeting part. The meetings are so long and I rather be playing than read over the play book. I have had surgery on my labrum but other than that I’ve been pretty blessed with no serious injuries. LV: You ran a 4.44 at your Pro Day in March – was that your best time or were you robbed by a slow stopwatch holder? NS: I was told I ran a sub 4.3 by a lot of the players and my agent and heard that they( the scouts) added a tenth of a second to our times because we were running on a fast surface. LV: Marshawn Lynch uses Skittles, what do you use to give yourself a half-time boost in a game? NS: Usually a candy bar or protein bar to hold me through the next half. LV: What are your top three on-field memories playing football at any level? and what in your eyes is your greatest achievement so far? NS: Top three memories would have to be my 3rd varsity game in highschool we played La Marque and highly scouted game, and I had three interceptions during that game. The other ones would have to be this years Penn State Bowl Game and putting on a NFL teams jersey. Greatest achievement would have to be where I’m at today. Very fortunate to be here and given this chance. LV: What is your motto – or what is the phrase you use to describe how to live your life? NS: Just live as its your last day and everything good or bad happens for a reason. LV: Do you have an charities or any appeals that you would like me to promote? I will happily write about any charity that you or your family support and will promote the website or any social media links? NS: I don’t know about any charities but would love to get involved. LV: What are your hobbies outside football? NS: I like to watch movies, play video games, and hang out with friends, family, and my dog. LV: If you didn’t become a professional football player what career would you have pursued? NS: I would purse something with sports whether it’s coaching or working with athletes of any sort. LV: If everything goes to plan and you get signed to a longer term deal by the Bills what will that mean to you? NS: That would mean everything to me… I’m already living the dream by just being here but that would be so awesome to get that opportunity. LV: What are some of the biggest cultural differences between Houston and Buffalo? What are you missing the most already? NS: The weather obviously and the food. I missing the Southern food. 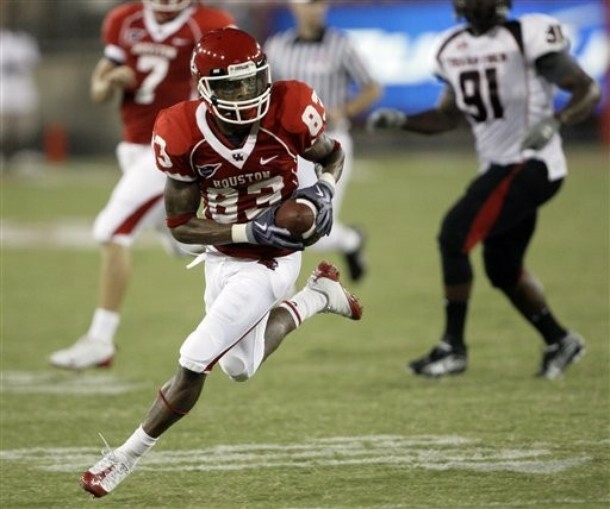 LV: Who was the toughest wideout you played against and why? NS: The toughest would have to be honestly probably Patrick Edwards on our team. He’s so fast and elusive. Patrick Edwards – now a Detroit Lions player. LV: Are you looking forward to the London 2012 Olympics? What sports will you be following closely and do you know anyone who is in any of the USA teams? LV: If you were an athlete at the 2012 Olympics what sport/races would you be competing in? NS: I would like to compete in the 4×100 meter race. That’s the funniest race to watch to me. LV: Thank you very much for your time Nick. Everyone in England wishes you the best in making the opening day roster for the Buffalo Bills. Interview conducted by Lawrence Vos – June 14 2012.